Town in the Turkish vilayet of Aidin, twenty-eight miles northeast of Smyrna. It has a population of 40,000, of whom 1,800 are Jews (against 1,200 in 1838). The community there is said to be older than that of Smyrna. Richard Pococke, who visited the city about 1733-34, says ("Description of the East," ii. 56): "Several Jews [of Manissa] exported goods to Smyrna and Europe. They also manufactured calicoes, and usually were rich. To-day they are the commercial leaders. As artisans, they are chiefly shoemakers, tinsmiths, etc. The young women have recently begun to learn the manufacture of Turkish rugs, and this industry is in quite a flourishing condition." When Tournefort visited the district in 1702 ("Voyage au Levant," ii. 490) he found three synagogues there; now there are five—named Shalom, Mayorca, Toledo, 'Eẓ Ḥayyim, and Talmud Torah. The oldest of these, Shalom, was destroyed by fire, but has been rebuilt. Among its benevolent societies are the ḥebra ḳaddisha; the Hospital Society; the Mohar u-Mattan, which assists and dowers girls who wish to marry; the Ḥesed shel Emet, which provides for poor families in time of mourning; the Shilluḥim, to assist strangers and the poor to emigrate; and the 'Ozer Dallim, which provides the poor with shoes. The different societies have their own revenues. There are two cemeteries, one old and the otherdating back about a century. In the former, tombstones dated 5406 (= 1646) have been found. A portion of the old cemetery was occupied for some years by Mohammedan refugees, who mistook it for vacant ground, and built houses there. To save the new cemetery from a similar fate, it was enclosed with walls in 1900 by the ḥebra ḳaddisha, which spent for this purpose 400 Turkish livres. The community has a small but well-organized hospital, which was founded in 1869 on the initiative of Rabbi Ḥayyim Maẓliaḥ and Rabeno Algranati. Before the establishment of schools by the Alliance Israélite Universelle (one for boys in 1892 and another for girls in 1896) the Talmud Torah was the only educational center. The school buildings stand on a fine estate belonging to the community. After the foundation of these schools the Talmud Torah ceased to exist, and modern ideas of progress have been adopted. 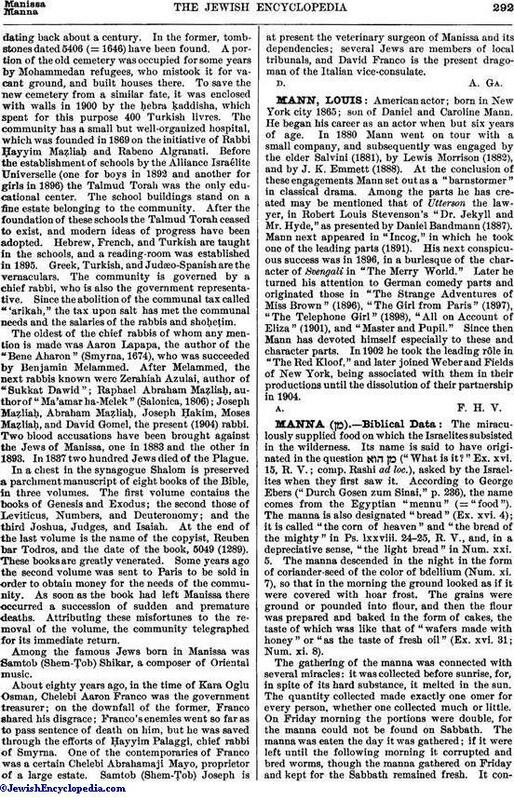 Hebrew, French, and Turkish are taught in the schools, and a reading-room was established in 1895. Greek, Turkish, and Judæo-Spanish are the vernaculars. The community is governed by a chief rabbi, who is also the government representative. Since the abolition of the communal tax called "'arikah," the tax upon salt has met the communal needs and the salaries of the rabbis and shoḥeṭim. The oldest of the chief rabbis of whom any mention is made was Aaron Lapapa, the author of the "Bene Aharon" (Smyrna, 1674), who was succeeded by Benjamin Melammed. After Melammed, the next rabbis known were Zerahiah Azulai, author of "Sukkat Dawid"; Raphael Abraham Maẓliaḥ, author of "Ma'amar ha-Melek" (Salonica, 1806); Joseph Maẓliaḥ, Abraham Maẓliaḥ, Joseph Ḥakim, Moses Maẓliaḥ, and David Gomel, the present (1904) rabbi. 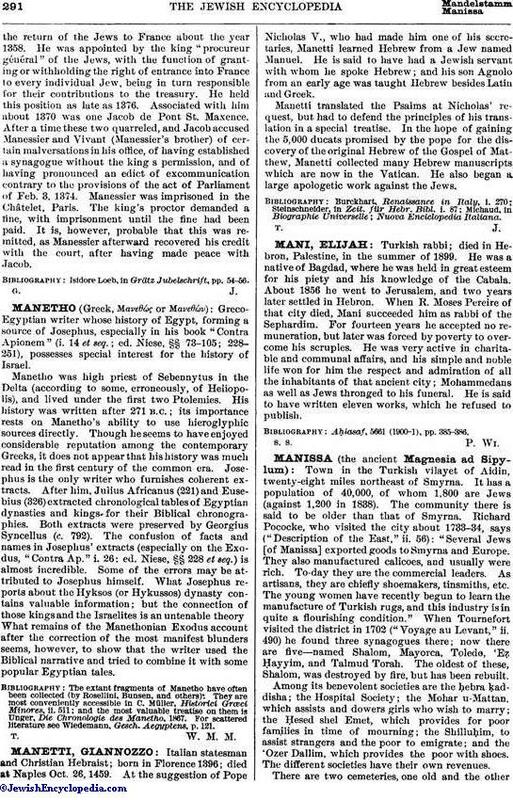 Two blood accusations have been brought against the Jews of Manissa, one in 1883 and the other in 1893. In 1837 two hundred Jews died of the Plague. In a chest in the synagogue Shalom is preserved a parchment manuscript of eight books of the Bible, in three volumes. The first volume contains the books of Genesis and Exodus; the second those of Leviticus, Numbers, and Deuteronomy; and the third Joshua, Judges, and Isaiah. At the end of the last volume is the name of the copyist, Reuben bar Todros, and the date of the book, 5049 (1289). These books are greatly venerated. Some years ago the second volume was sent to Paris to be sold in order to obtain money for the needs of the community. As soon as the book had left Manissa there occurred a succession of sudden and premature deaths. Attributing these misfortunes to the removal of the volume, the community telegraphed for its immediate return. Among the famous Jews born in Manissa was Samtob (Shem-Ṭob) Shikar, a composer of Oriental music. About eighty years ago, in the time of Kara Oglu Osman, Chelebi Aaron Franco was the government treasurer; on the downfall of the former, Franco shared his disgrace; Franco's enemies went so far as to pass sentence of death on him, but he was saved through the efforts of Ḥayyim Palaggi, chief rabbi of Smyrna. One of the contemporaries of Franco was a certain Chelebi Abrahamaji Mayo, proprietor of a large estate. Samtob (Shem-Ṭob) Joseph is at present the veterinary surgeon of Manissa and its dependencies; several Jews are members of local tribunals, and David Franco is the present dragoman of the Italian vice-consulate.